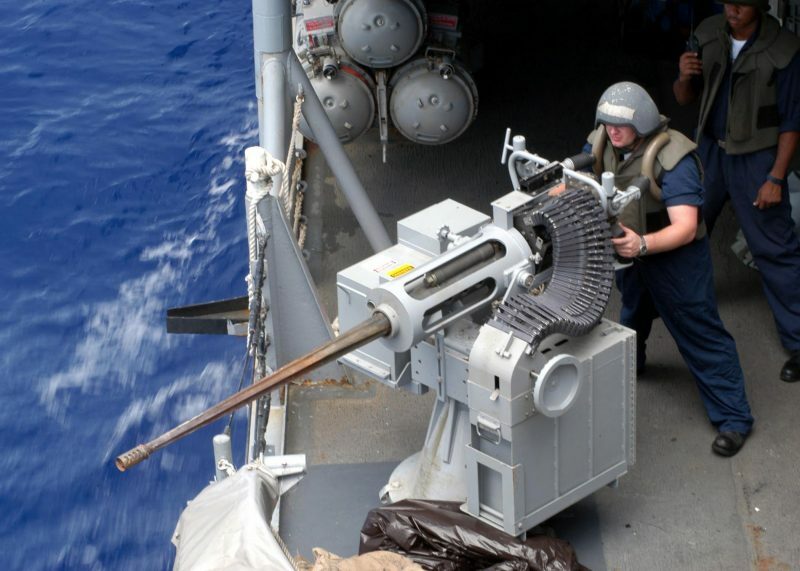 In February 2013 sailors assigned to LHD 3 USS Kearsarge conducted a firing exercise with live ammo using the powerful Mk38/ M242 Bushmaster at sea. This training exercise was conducted by the 26th Marine Expeditionary Unit as part of a six-month pre-deployment training program. This weapon has the capability to destroy slow-flying aircraft, helicopters, and lightly armored vehicles. An autocannon that is chain-driven, the M242 Bushmaster is a 25mm weapon. US military uses this weapon extensively. With a standard fire rate of 200 rounds per minute, it can suppress any enemy positions such as occupied built-in areas and exposed troops. The weapon’s effective range is 9,800 feet, which is dependent upon the kind of ammunition used. It is one of the most successful autocannons having sold more than 10,000 units around the world. 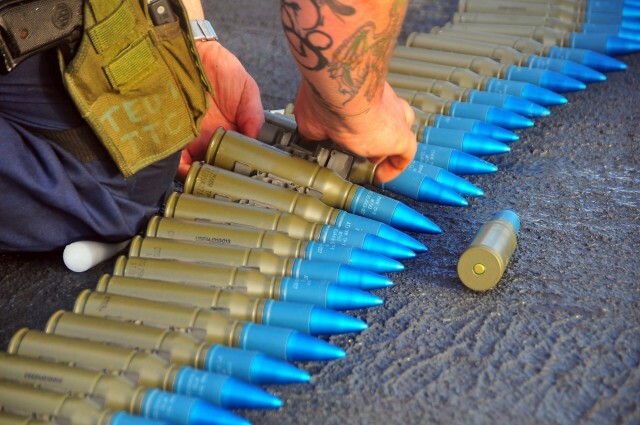 M793 Target Practice with Tracer (TP-T) rounds for the MK-38 being inspected. The M242 is different than other automatic firearms because it uses a 1-hp DC motor instead of gas or recoil for activating the firing system. It has a three-part weapon assembly that includes the receiver, the barrel, and the feeder. This three-part system makes it easy for two people to remove or install the weapon in ideal conditions although it is heavy. It offers electrical and manual firing controls as well as three fire rates including single-shot semi-automatic, low-rate fully automatic, and high-rate fully automatic.